Home rituals Paranormal Ritual/Game -- Pencil Answering Game. Paranormal Ritual/Game -- Pencil Answering Game. Paranormal Ritual/Game -- Pencil Game. The Pencil Game is an old Mexican tradition supernatural ritual that is used to contact a ghost. It is sometimes called “Six Pencils” or “Charlie, Charlie”. The Pencil Game can only be played with two people. You need six unsharpened pencils. 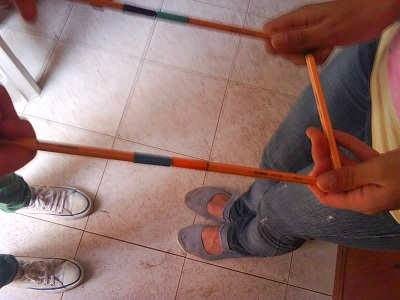 Step 1: Each person takes three pencils and arranges them to form three sides of a square (as in the picture above). The ends of your pencils should be touching. You should be holding the pencils at the sharpened tip. Step 2: Both of you say the following chant twice: “Charlie, Charlie, can we play?” If the pencils move inwards, the answer is Yes. If the pencils move outwards, the answer is No. If one side moves inwards and the other moves outwards, it means Maybe, or that the question cannot be answered. Also, up means Yes and down means No. “The game “Charlie, Charlie” was a big thing at my school, and I came home and played it with my Mom. My Mom and Dad got all mad and said that the game was just like the ouija board. supposedly it’s a call to the devil… No offense, but it’s scary… I started hearing things around my house after I played it” There are no reports of anyone dying or being possessed by demons after playing the Pencil Game so it is considered quite safe.